Art Below Invite you to 'Art of Angel' Private View on 22nd January. Art Below requests the pleasure of your company at the launch event of ‘Art of Angel’ on Thursday 22nd January 2015 with a drinks reception from 6pm to 9pm. 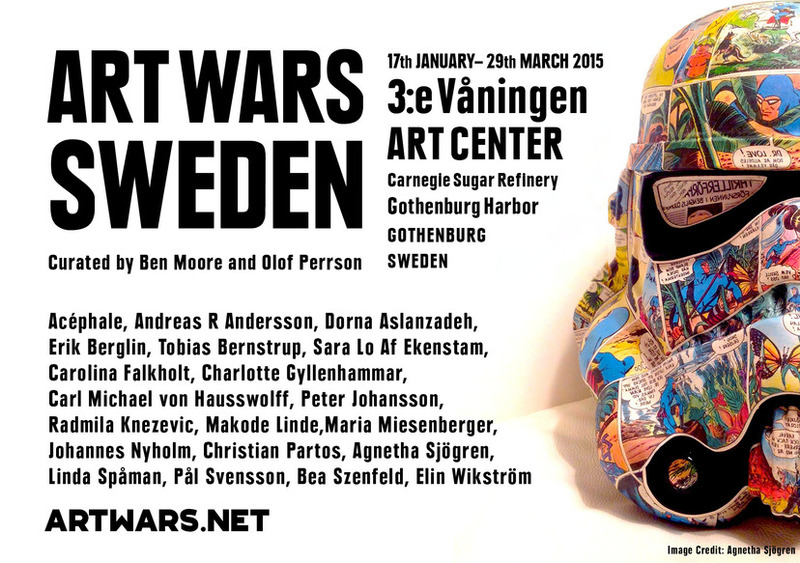 ART WARS SWEDEN, 17th January - 29th March 2015. A broad lineup Swedish artists such as Charlotte Gyllenhammar, Carl Michael von Hausswolff, Carolina Falkholt, Makode Linde, Linda Spåman, Peter Johansson of Sweden, Bea Szenfeld, are participating in 'Art Wars Sweden' at the Arts Centre 3rd Floor in Carnegie sugar mill at Gothenburg harbor opening on 17th January 2015. Art Wars was unveiled at the Saatchi Gallery during Frieze week in October 2013 featuring 20 artists including Damien Hirst, Jake and Dinos Chapman, David Bailey, Alison Jackson, Joana Vasocncelos and D*Face and was initiated by the British curator and artist Ben Moore. Proceeds from the exhibition go to Missing People charity Sweden and the Missing Tom Fund to support the ongoing search for Ben Moore's brother Thomas Moore who has been missing since 2003. Thank you for taking the time to read through our newsletter. This e-mail is intended only for the named person or entity to which it is addressed and may contain valuable business information that is privileged, confidential and/or otherwise protected from disclosure. Dissemination, distribution or copying of this e-mail or the information herein by anyone other than the intended recipient, or an employee, or agent responsible for delivering the message to the intended recipient, is strictly prohibited. All contents are the copyright property of the authors, all rights reserved unless otherwise agreed. If you are not the intended recipient, you are nevertheless bound to respect the sender's worldwide legal rights. Please note that unintended recipients should delete the e-mail and destroy all electronic copies in their computer systems, retaining no copies in any media. Art Below Ltd. Registered in England No.05697608.